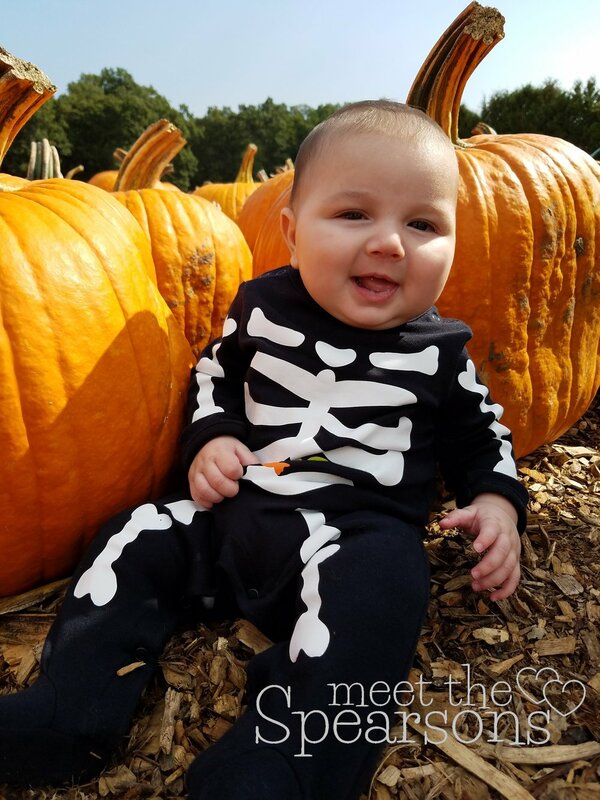 Starting with... baby's first pumpkin patch! I think there's a rule written somewhere that parents have to bring small children to pumpkin patches in the month of October, yes? Did we get that right? It was a beautiful Saturday (seriously, for October it was HOT) and so we loaded the baby in the car and promised the first of many trips to the farm. When we got there, E was captivated. There were so many things to see, along with lots of new sounds and smells. He quietly took it all in, wide eyed and excited. We visited the petting farm, and saw chickens and goats and sheep and bunnies - oh my! It was all so foreign to him. We also took a trip through the not-corn maze, which E wasn't really a fan of. I don't like corn mazes because I'd had some bad experiences of getting lost in them and stuck for hours, but I actually liked this not-corn maze. It was short enough you could wander through but easily find exits. My kind of maze! E didn't agree though and cried anytime he got too close to the hay. Not his spot. The pumpkins, though, were more his speed. We even got a few giggles out of him as we picked out a couple. We probably won't carve any this year, but we wanted a few to line our path outside our house. #EasyDecorating! We left with pumpkins and cider donuts and sweet corn and apples and fully bellies. It was a great day, and we're so excited to do it again in future years. Maybe we'll even pick our own apples - this year we just grabbed them from the store. E had so much fun, he passed out in my arms as we were walking back to the car. He tried so hard to stay awake, but just couldn't do it. So we went back to the car, loaded him in the carseat, and drove off with a happy, sleeping baby. The perfect sign of a great day.